Gokoku Shrine (茨城県護国神社) is located in Mito, Ibaraki. 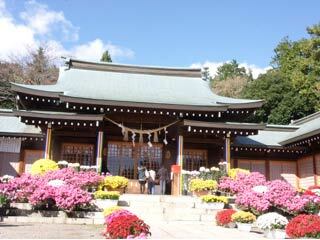 Gokoku Shrine is built in1878 for the worship of soldier who died during a war, especially Meiji Restoration. Now, it is one of the preserver shrine for Japan and all Japanese. There is parking. There are many events through a year. In 1941, all people in Ibaraki prefecture wished to worship their friends and families who died during the war, and built this shrine at Sakura mountain. There are memorial monuments for 6,3494 solders. There are many Matsuri hold in this shrine. June: Ajisai Festival. There are 3,000 Ajisai will be displayed.